I, too, can attest to a couple brief moments in which I personally experienced Fr. Jozo’s holiness. 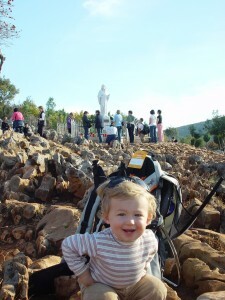 On my first trip Medjugorje, in 2001, along with my husband, John, I was standing outside on the steps of St. Elisha Church, Siroki Brijeg, where Fr. Jozo used to speak to and pray over pilgrims. At the time, I didn’t know who Fr. Jozo was. Standing near us was a man in a Franciscan robe, who looked at my husband, smiled slightly and gently, and seemed to stare into his soul. He lifted up a fatherly hand, and in a gesture so masculine, and at the same time so carefully loving, he reached out and pat my husband on the cheeck. I cannot fully explain this, but of all the miracles I experienced on that pilgrimage, that one simple gesture and the knowing gaze of Fr. Jozo upon my husband, had the most profound and lasting effect on my heart and memory. Fr. 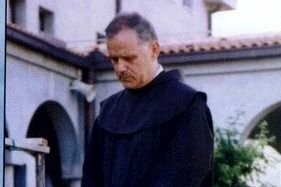 Jozo’s power of the Holy Spirit, lies in his docile humility. His words below echo a soul docile to the promptings of his mother and his God. omnipotence of our God. Pray for priests. By Christine Watkins, author of Full of Grace: Miraculous Stories of Healing and Conversion through Mary’s Intercession. 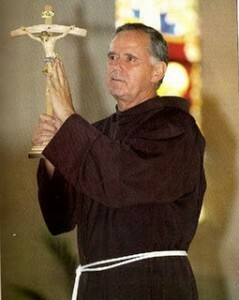 Siroki Brijeg – The world renowned Franciscan, Fr. 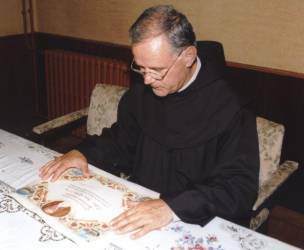 Jozo Zovko, was more than surprised when yesterday Polish pilgrims came to thank him for twenty-one years of testifying to the Medjugorje apparitions, and especially when they handed him a thank you note personally signed by the shaky hand of their best known compatriate, John Paul II. Actually, after coming back from Poland the Pope wrote from the Vatican to personally thank and send his apostolic blessing to Fr. Jozo Zovko. ‘Our Poland is grateful for your every word, for every thing that you have done for us’, said the Pope’s collaborator, Krystyna Gregorezyk, who personally handed the thank you note to Fr. 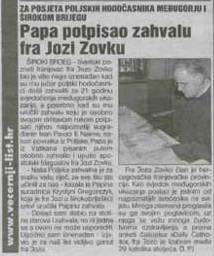 Jozo in the Siroki Brijeg church. ‘So far I have received hundreds of gifts and thank you notes but none can compare with this one. 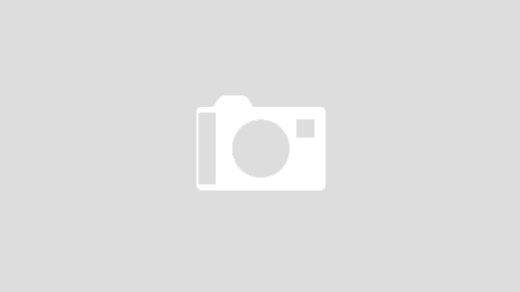 I am most pleasantly surprised,’ a visibly shakened Fr. Jozo said for our paper. The Original Text in Italian:“Imparto di cuore una particolare Benedizione Apostolica a Padre Yozo Zovko, o.f.m. 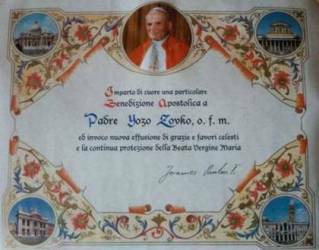 ed invoco nuova effusione di grazie e favori celesti e la continua protezione della Beata Vergine Maria”Joannes Paulus II English Translation:“I grant from the heart a particular blessing to Father Jozo Zovko, o.f.m. and I invoke a new outpouring of graces and heavenly favors, and the continuous protection of the Blessed Virgin Mary”.Joannes Paulus II. Now, according to what Krystyna Gregorezyk reported when she presented the message, the letter was written this month in Rome right after the Pope’s return from Poland. Krystyna, who works as a collaborator of the Holy Father in the Vatican, had breakfast with him and several other Polish people before they left for Medjugorje. The Pope signed the letter in front of Mrs. Gregorezyk. Of course, more enquiry should be made about this incredible event. 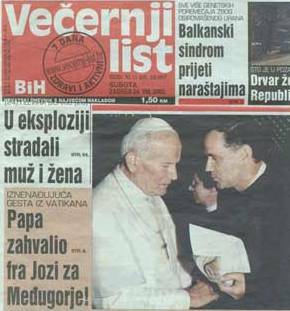 However, today it seems that this is the first written personal word of encouragement, from the Pope, made public by the media, to a witness of Medjugorje. This simple letter stands as a tangible and visible document in support of the Holy Father’s heartfelt thanks and encouragement that he sent to Fr. Jozo through Krystyna. 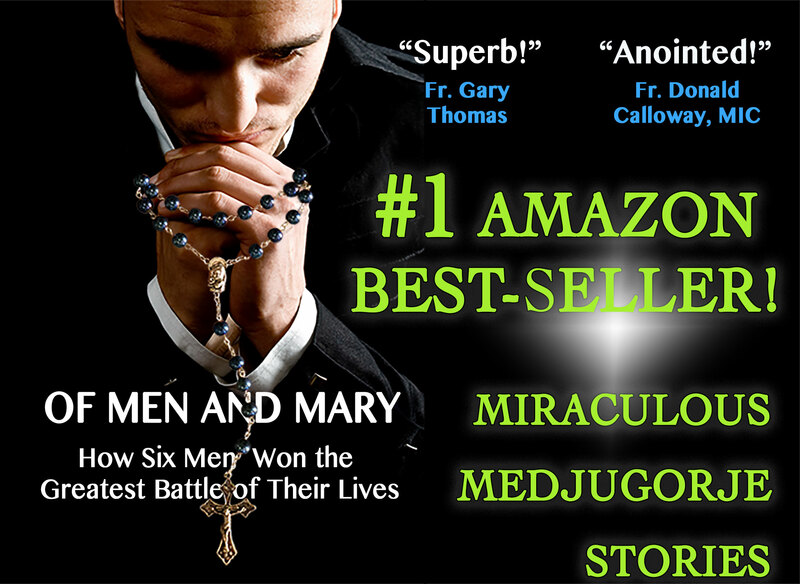 All are encouraged to spread this news – that the Holy Father has sent such a heartfelt blessing to this champion for Medjguorje and Our Lady’s apparitions!